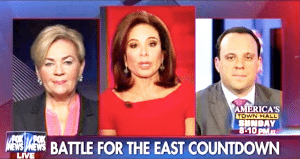 With another Super Tuesday ahead in just a few days, Judge Jeanine Pirro addresses the five primaries in Pennsylvania, Connecticut, Rhode Island, Maryland and Delaware. Judge Pirro asks the Democrat, Mary Anne Marsh what she believes is likely to be the course of action for Bernie Sanders, given his inability mathematically to reach the number of delegates necessary to secure the Democrat nomination prior to the convention, while noting that he has almost matched Clinton in fundraising. Pirro notes the damage he’s doing to the already morally flawed candidate and asks Marsh, “He’s just hurting her so can’t you guys get him to quit?” The short answer is no, they can’t. Pirro then raises the issue that 1/3 of the Sanders supporters claim there is no way they are voting for Clinton, a statistic that Marsh seems to be well aware of. Sanders is refusing to commit to supporting or even asking his supporters to vote for Clinton and there is a real chance that many of them, in spite of the disruptions they have created at Trump rallies, would support the businessman over the corrupt career politician that they see as dishonest and part of the problem. 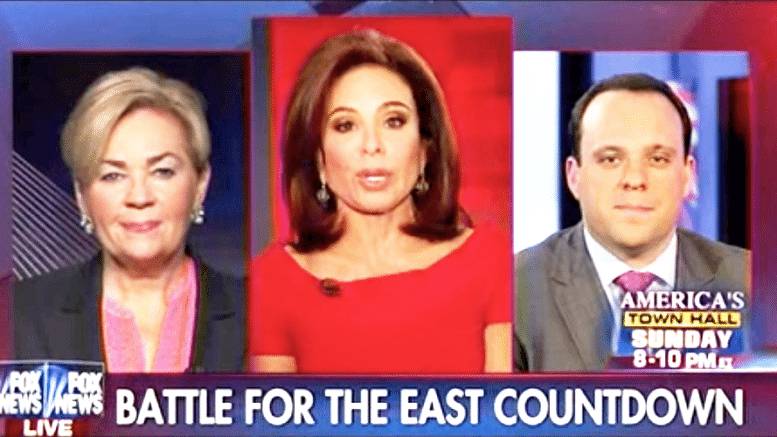 The Republican strategist, Boris Epshteyn, agrees with Judge Pirro, believing that Sanders will refuse to urge his supporters to shift to Clinton. He says “If Sanders doesn’t really push for her, those people are going to stay home or come out for Donald Trump.” Marsh nods in agreement as Pirro says it only makes sense that the Sanders supporters would back Donald Trump as he, like Sanders, is an outsider. They discuss the Vice President possibilities, with several women, including Elizabeth Warren being tossed around as possibilities on the Democrat side. Epshteyn is of the opinion that it doesn’t matter who she selects, Clinton is such a flawed candidate that all of the attention is going to be on her, and it’s going to be negative. Catholics, The Severely Backwards Religion Of Convenience… Said NO Republican Ever!